Plant a tree in memory of John D.
Be the first to share your favorite memory, photo or story of John D.. This memorial page is dedicated for family, friends and future generations to celebrate the life of their loved one. 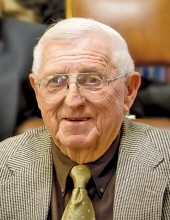 John D. Walker, age 88 of Lancaster, WI, passed away Wednesday, February 6, 2019 at Grant Regional Health Center in Lancaster. He was born July 8, 1930 in Lancaster the son of Glenn “Crow” and Amelia “Molly” (Westemeier) Walker. John graduated from Lancaster High School in 1948 and completed his education at Bayless Business College in Dubuque, IA. He served in the U.S. Army from 1951-1953, where he was stationed at Camp Pendleton during the Korean Conflict. On February 16, 1955, John married Mary Louise Pink at St. Clement Catholic Church in Lancaster. John worked for several years with his dad, “Crow”, and Leroy Seipp at the Walker and Seipp Clothing Store in Lancaster. After Crow’s death in 1959, John became a partner in the business and took over the store on his own in 1969. He retired in 1992 after turning the family business over to the next generation. John belonged to the American Legion Post #109 in Lancaster for 65 years, serving as Post Commander in 1959. He was also an active member of the Lancaster Commercial Club, where he and John O’Rourke often led “business meeting discussions” at the Old Hotel while Mark Jeidy served refreshments. John enjoyed fishing, and would go with his buddies on an annual hunting trip to South Dakota. He especially loved being surrounded by family and friends: summer weekends with family at the cabin on the Ambro in Prairie du Chien, WI, or hosting visitors during the winter at King’s Gate in Port Charlotte, FL. John is survived by his wife, Mary Lou; their children: Jeff (Karen) Walker, David (Mona) Walker, Mike (Kate) Walker, Steve (Laurie) Walker, Sharon (Bruce) Friederick, and Tom (Signe) Walker; nineteen grandchildren: Alix (Ben), Taylor (Justin), Amber, Adam, Brock, Chelsey, Glenn (Kristen), Greg (Olga), Scott, Alyssa (Dan), Liz, Erin, Meg, Tom (Amanda), Ellen (Bryant), Claire, Sam, Janek, and Hannah; seven great-grandchildren: Blake, Joseph, Mason, Tuker, Lincoln, Camden, and Dayton; and one very special Cavalier King Charles Spaniel, Charlie. In addition to his parents, John was preceded in death by a sister, Betty (Wayne) Pett. A Mass of Christian Burial will be held at 11:00 a.m., Monday, February 11, 2019 at St. Clement Catholic Church in Lancaster with Fr. William Vernon officiating. Burial with Military Honors will be in the St. Clement Cemetery. Family and Friends may call from 2:00 p.m. until 6:00 p.m. on Sunday, February 10, 2019 at St. Clement Catholic Church, and on Monday, February 11, 2019 from 10:00 a.m. until time of services at the church. In lieu of plants and flowers, a John D. Walker Memorial Fund has been established. The Martin Schwartz Funeral Home & Crematory of Lancaster is entrusted with his services. To plant a tree in memory of John D. Walker, please visit our Tribute Store. Military Honors will take place at the cemetery. "Email Address" would like to share the life celebration of John D. Walker. Click on the "link" to go to share a favorite memory or leave a condolence message for the family.